This week I have another 40 British Quad Posters from the 60’s to 1980’s, including two more offerings from renowned Artist Tom Chantrell – “Emperor Of The North” and “Alistair MaClean’s Puppet On A Chain”. Also listed is an Original 1958 Quad Poster for Walt Disney’s “Old Yeller” with the apt tag line “Sure To Become The Most Talked About Movie For Years!”. From the 1960’s titles include “Joey Boy” starring Harry H. Corbett, “The Alphabet Murders” Starring Robert Morley as Hercule Poirot, “In Search Of The Castaways” featuring Hayley Mills alongside Maurice Chevalier and a Teaser poster for the 1961 Walt Disney “The Absent Minded Professor”. 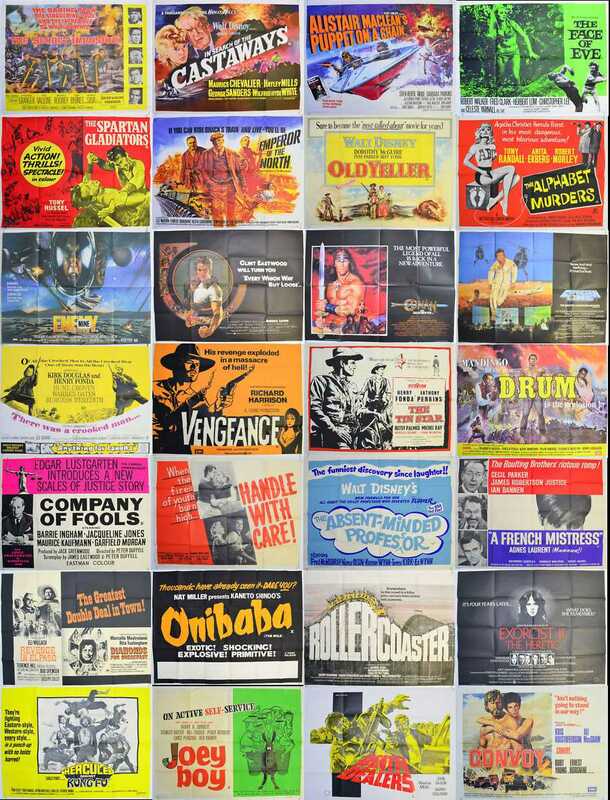 70’s titles include “Drum” the 1976 sequel to “Mandingo”, “Convoy” starring Kris Kristofferson, “Every Which Way But Loose” (Clint Eastwood), “Rollercoaster” and a Horror Double Bill for “Carquake / The Giant Spider Invasion” Which has some great B-Movie Artwork. “Conan The Destroyer” heads the 1980’s selection which of course stars Arnold Schwarzenegger, Other 80’s fare includes “Enemy Mine” and Peter Bland’s comedy “Came A Hot Friday”. More titles of note include Westerns “The Tin Star” (1957), “Vengeance” (1968) and “There Was A Crooked Man” starring Kirk Douglas and Henry Fonda. Plus the 1968 Fantasy Adventure “The Face Of Eve” from 1968 starring Celeste Yarnall. MONTY PYTHON (1975) Original Quad Poster - Double Bill - Holy Grail / Now For..